This is the guide that jump-started TheScrabbleGal’s now famous line of instructional PDF tutorials and E-books! 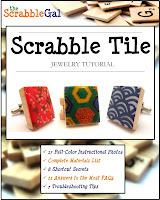 If you’re new to Scrabble tile crafting, then this guide is the perfect place to start! 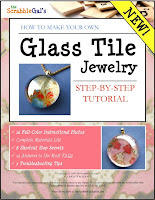 This full-color, step-by-step tutorial teaches you everything you need to know to make your very own gorgeous Scrabble tile jewelry using decorative papers. Looking to have some fun with photos? This is the popular follow-up to TheScrabbleGal’s: Original Scrabble Tile Tutorial. 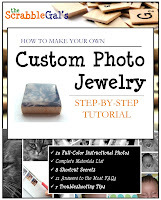 This full-color, step-by-step tutorial teaches you everything you need to know to make your very own gorgeous photo jewelry. I guide you through the entire process including photo editing so that you can make the most of your photos! SCRABBLE IN STYLE Vol. I: 77 Fun & Fresh Projects! Well you asked for it, and you got it! This Jam-Packed Full-Color PDF Guide (40+ pages!) goes WAY beyond the classic Scrabble tile pendant. 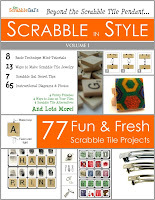 In this guide, you’ll discover everything you want to know about Scrabble tile crafting. 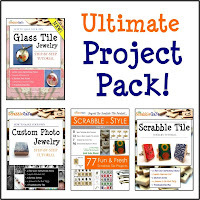 ULTIMATE PROJECT PACK: All 4 E-Books! Well, for a very limited time TheScrabbleGal is offering EVERYTHING you’ve read about above – an $80 value -- for only $33! You can save $47 right now by ordering all 4 products!